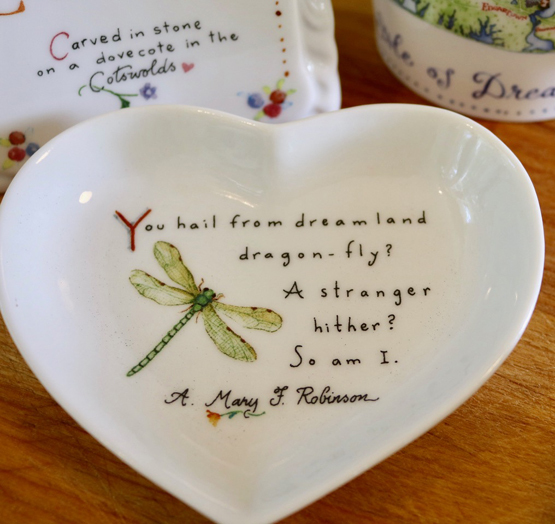 "Dragonfly” is one of Susan’s five new Heart-Shaped Dishes (see additional photos above) ~ made from extremely durable and non-porous porcelain, 4 7/8” across at widest point, and 4” tall, food safe, dishwasher and microwave safe. So many ways to use these pieces to add charm to your decor: as a teabag holder, a guest-bath soap dish, a dish to put your jewelry in, a pin dish, spoon rest, coin dish, candy dish, even a cat food dish ~ for the sewing room, the kitchen, bedroom and bath . . . as heart-gifts too.